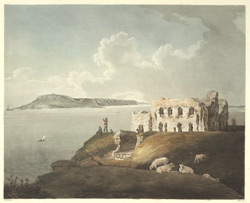 View of the ruins of Sandsfoot Castle which is located on the outskirts of Wyke Regis. It was built to protect English ships sheltering off Weymouth and Portland and also prevent an invasion from sea. It was built in the Tudor period and designed for the use of heavy guns. It is rectangular and has two storeys and an underground magazine. Because it was designed to repel a a sea-borne attack, it was vulnerable to attack from its land side and was captured by different sides, several times in the Civil War. The castle gateway to the right has since collapsed into the sea because of coastal erosion.